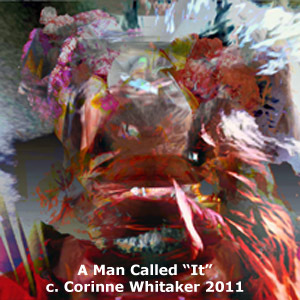 "A Man Called 'It'", from the series No More War, will be shown this month at the Wiseman Gallery, Rogue Community College, in Grant's Pass, Oregon. The exhibition is called "The Subject is War". 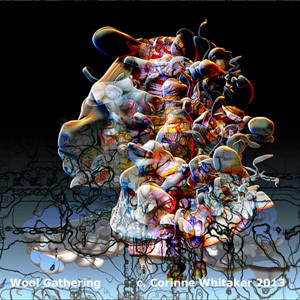 The new Paul Mahder gallery in Healdsburg, California is showing three of Whitaker's digital paintings on plexiglass, including "Wool Gathering". The opening reception is on Saturday, October 11 from 6 - 8 pm. You are all welcome to visit this stunning new 8000 square foot space as well as to explore this vibrant community. 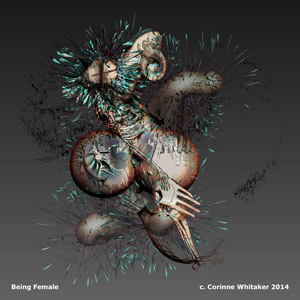 The Sandra Lee Gallery in San Francisco, CA is showing "Paradox" and "Being Female" at its "Real Surreal" exhibit. The Koehnline Museum at Oakton Community College in Des Plaines, Illinois, is showing "Longing" as part of its Gendering Desire: Liberation, Power and Pleasure exhibit now through October 24. 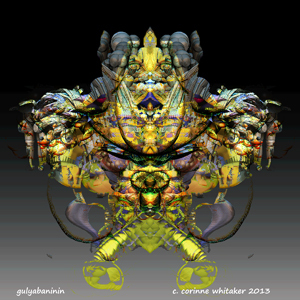 In spite of the creative spelling of my name, the D-Art Online Gallery is showing two of my images from the Boogie Woogie Woman series as part of its International Conference Informational Visualization and International Conference Computer Graphics Imaging and Visualization programs. Barbara Takenaga has been teaching art at Williams College for almost 20 years. Her exquisutely detailed acrylics on linen and wood seem to float somewhere in the cosmos, as though drawn with fine silk threads. A different take on pictures by robot is shown in an installation called Heart Bot. Here robots are connected to a drawing machine which is driven by the heartbeats of the user. People are invited to touch their fingers to a heart rate sensor while stepping on a pedal. The resultant drawings are projected onto a wall. The artist credits Sol Lewitt's conceptual realism for his inspiration, but he might truly have referenced Harold Cohen's Aaron (see above) as a precursor. Two beautifully sculpted female caryatids have been discovered guarding a tomb near Thessaloniki Greece. Elegantly carved in marble, with bits of red and blue paint, the figures wear earrings and tunics, and have thick long hair. Their posture and position suggest that this was the tomb of an important person from the time of Alexander the Great. It is thought that Olympia, mother of Alexander, was buried in this "magnificent" tomb. I have been privileged to know Dr. Pratapaditya Pal for decades, as a mentor, teacher, curator, and world-renowned expert on the art of India. Dr. Pal has agreed to write a series of articles for Asianart.com on his experiences over the years. In this article titled "The Last of the Mohicans: Remembering Robert Ellsworth 1929 - 2014", Dr. Pal gives us that rare insider's view of how the art world really works and how great curators and great collectors interact. Warren Chang lives and works in Monterey, California, where he produces paintings of figures and landscapes. There is a sturdy realism to his portrayals, with an overlay of mood and atmosphere. Twelve years ago he switched from illustration to fine art and the results have been auspicious. Above you see a new 3D printed digital sculpture of mine called "Dervish", inspired by the whirling dervishes that I saw years ago in Istanbul, Turkey. On a recent trip to Chicago, I saw the work of ceramist Vanessa L. Smith and felt an immediate affinity. 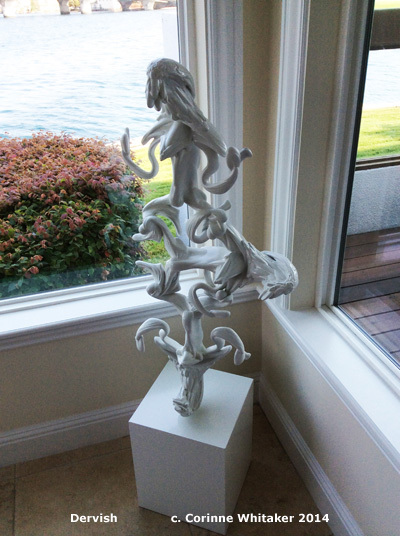 Her intricately carved ceramic sculptures are exquisite in their detailing, balance and elegance. Be sure to watch the slide show on the large sculptures portion of her site. You won't be disappointed. Park Avenue Armory in New York City showed a site-specific installation by Ernesto Neto. Titled "Anthropodino", the work featured hundreds of yards of translucent material in the lobby, halls, and passages, reminding viewers of "fabric stalactites". The admiring sponsors called Neto's piece "epic", "interactive", and "immersive". It looks engaging and luminous to me. If you have ever wondered how those wall-sized advertisements are created on the sides of high-rise buidings, here is a description of the process by the man who started a company called "Walldogs". His work methods are surprisingly low-tech, but the results are anything but old-fashioned. Richard Feynman was one of those brilliant, eccentric scientists that myth and memory only seem to enlarge. Caltech University in Pasadena, California, is now making some of his colorful lectures available for free online. If you would like to learn more about physics, as taught by an innovative teacher, you would do well to log in to these lively and informative lectures. Want to drive and fly in one vehicle? Just try the collapsible aeromobile flying car, designed by an engineer in Slovakia. Stefan Klein is promoting his third version, since the first one was shown in the early 1990's. With its collapsible doors and overall size designed to fit into a standard parking space, the aeromobile can be filled up at any gas station and can take off and land at any airport. Perhaps you are as much a fan of the late Robin Williams as I am. If so, you will recall his inimitable performance on the program "Inside the Actor's Studio". Williams was asked by host James Liston how Williams' mind managed to react so quickly. The answer is classic Robin, and a sad reminder of just much we have lost with the death of this brilliant actor. Frankly, I'm not sure whether to laugh or cry over this one but as a giraffe I had to share it. (thanks to CH).